The Musee Carnavalet, which chronicles the unique and rich history of Paris from it’s founding in 250 B.C., is set to close in October for a three-year, 43 million euro renovation project aimed at restoring portions of the 17th century mansions that house the museum, improve the presentation of the museum’s collections, add new exhibits, and make the facility handicap accessible. The renovation is part of a larger 100 million euro plan to revitalize 14 city-owned museums between now and 2020. The Carnavalet and the Musee Jean-Moulin are the first two museums to begin renovation work through the citywide project. 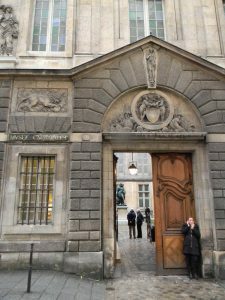 Specific changes at the Carnavalet will include a reorganizing of the museum’s collections so that the flow between exhibits is more intuitive and chronological than the current museum plan. The museum also will add a new heritage and cultural resource center, an events space and a children’s program. Among the other museums that will be improved or enhanced through the massive renovation program are the Paris catacombs, for which a new entry and exit will be installed; the Museum of Modern Art, which will make changes to its permanent collection space and its public courtyard; the Petit Palais; the Musee Bourdelle; the Palai Galliera; and the Maison Victor Hugo. The Musee Carnvalet is free, and open Tuesday-Sunday 10 a.m. to 6 p.m. (Closed Mondays.) It is located in the Marais at 23 Rue de Sevigne. 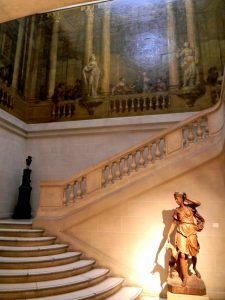 The Mu see Carnavalet is one of Paris’s most interesting and educational museums, chronicling the history of the City of Light from its founding on the Ile de la Cite in 250 B.C. to today’s 21st century center of business, finance, art and culture. The collection is massive, and only a fraction is on display in the museum’s nearly 100 rooms. All told, the museum houses 2,600 paintings, 20,000 drawings, 300,000 engravings, 150,000 photos, 2,000 sculptures, 800 pieces of furniture and countless other items of historical significance.Specific periods well represented in the museum include: Lutecia (the period when Paris was ruled by Rome), the Medieval city, the Renaissance, Protestant and Catholic wars of religion, the French Revolution, Napoleon’s Paris, and Paris of the 19th, 20th and 21st centuries. 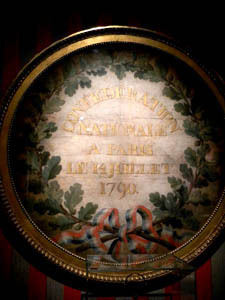 Key pieces on display include: Jewelry and furniture taken from Versailles during the French Revolution, a recreation of Marcel Proust’s bedroom, Benazech’s painting “Execution of Louis XVI,” a painting of Marie Antoinette by Kuchaski, many of Madade Sevigny’s letters, and the final letter ever written by Robespierre. Don’t miss the gorgeous landscaped garden in the courtyard between the two mansions, which is particularly lovely in late spring. The Musee Carnvalet is free, and open Tuesday-Sunday 10 a.m. to 6 p.m. (Closed Monday.) It is located in the Marais at 23 Rue de Sevigne. 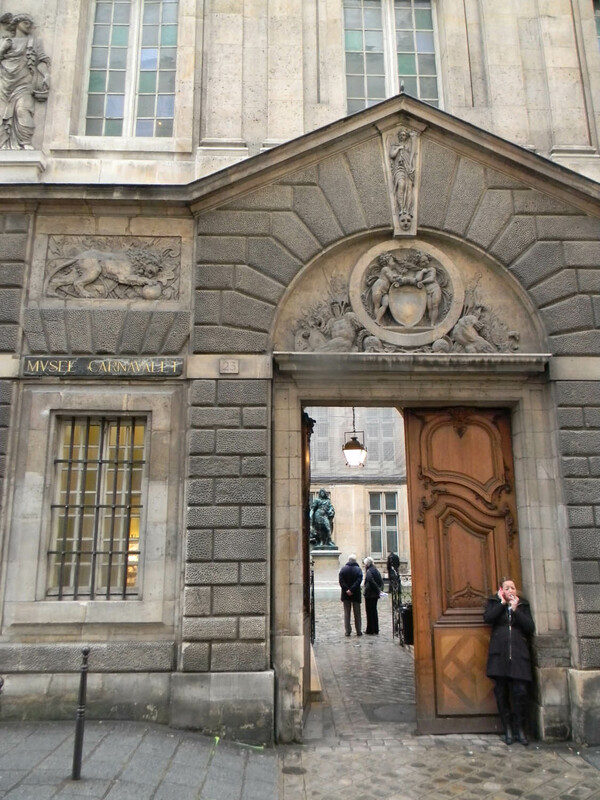 This entry was posted in Art, History of Paris, Marais, Museums and tagged mansions of the Marais, Musee Carnavalet, Renovations and Improvements by Bob Adams. Bookmark the permalink.